Back in the day, not being into the lets-get-sloshed-on-the-weekend scene, I would often meet up with friends in various spots to hang out, chat, and occasionally grab coffee. One of those spots was Princeton Panera, mainly because it was obvious and had not bad coffee. Then, three years ago, meeting up with friends in Princeton suddenly became passe' (probably because the drive for some of us was extensively longer then others) and as I grew more finicky with my coffee, Panera coffee became much more of a memory then a good idea. Then the other day, the old meeting spot was reconciled as a bit of a reunion amongst old friends. We met up for dinner at the Triumph Brewing Company which was a poor match of price to quality, but nonetheless an ok dinner. Then afterwards, we decided instead of Panera (though we did sit outside for a second while we waited for more pals) to try out Small World Coffee, a local Princeton roaster that I've had mixed experience with (some good, some very bad). We arrived sometime around 7pm-ish during an open mic. The place was mostly empty, though the seating capacity is extensive to accommodate the numerous students and faculty. 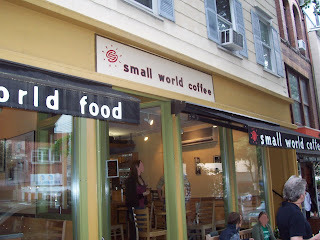 As mentioned before, my past experiences with Small World have mainly been with their drip (as well as their really expensive baked goods!). I've had several really bitter cups out of their pots, but I was pleasantly surprised when I got a not-bitter cup this time. It was smooth but still nothing fantastic. The espresso was also fairly decent, with a nice citrusy tang but also fairly bland. On a positive note, the baristas did seem to have a decent knowledge of how to pull good shots. On a side scrawl, the tea was Rishi and the chai, according to my friends, was "spicy." To put it bluntly, I strongly prefer Small World to their local chain competitors (Panera and Starbucks) plus there are few alternatives anywhere nearby, but they still could improve in some areas of quality. So if you're a student or in town visiting, it's not such a small world when it comes to finding a good cup of coffee, so give Small World a go.